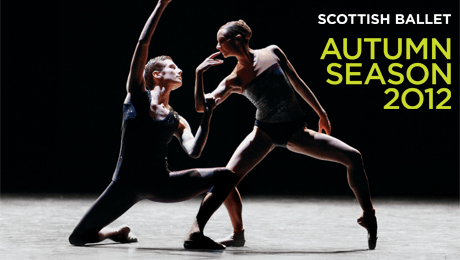 The Scottish Ballet’s ‘Autumn Season’ is a triple bill, demonstrating both physical strength and daring in three very distinct performances. The evening opens with ‘Run for It’, a piece created earlier this year by choreographer Martin Lawrance as part of the cultural Olympiad. Lawrance’s choreography references the Olympics in a number of ways, weaving exaggerated sprinting and vaulting movements into the routine, and expressing the relentless determination required of athletes in competition. The dance is set to the frenzied music of David Adams; jabbing, jarring sounds of the instruments create an atmosphere of high-tension, reminiscent of ‘crisis moments’ in horror soundtracks. This sense of intensity never lets up. Instead, it is sustained throughout the performance, and finds itself echoed in the dancers’ movements. They create angular shapes with their bodies, continually flexing their arms, feet and legs into harsh, jagged lines. While the dancers’ movements may be technically excellent, the piece can be disorientating at times as it lacks any sense of narrative. With the dancers wearing near-identical blue leotards, there is no real sense of character or relationship. Instead, ‘Run for It’ seems to be simply about showcasing pure physical strength. It becomes apparent, throughout the piece, that that these dancers are equally as athletic as the sportsmen and women they emulate. Moving away from the controlled, athleticism of the first act, William Forsyth’s ‘Workwithinwork’ is a performance infused with a sense of disconnectedness. Sometimes the dancers move in long, yawning stretches, while at other times they twitch and twist their bodies at unnatural angles. Much like in the act before, the atonal music of ‘Workwithinwork’ – composed by Luciano Berio – sets the audience on edge throughout. There are moments when the dancers’ movements seem oddly comic, such as when they waddle across the stage in a Charlie Chaplin-esque manner. The comedy, however, is undercut by the anguished sound of distressed violins. The sound is fragmentary, often stopping just as it builds towards something new. When this happens, the dancers also stop moving, regain neutral facial expressions, and walk off the stage. As human beings, we have an innate desire for narrative and relationship and what makes ‘Workwithinwork’ so uncomfortable to watch is its continual thwarting of this desire. The piece redeems itself from completely alienating the audience when – about halfway through – something like a story begins to unravel. It happens like this: the music has come to another abrupt stop, and two dancers are walking off stage. Just as the female dancer is about to leave, a male figure appears, catches her arm, and gently turns her around. The theatre is silent as the two figures are left alone on the stage. And then, the music starts. It is quieter than it’s been throughout the whole performance, and, slowly, they begin to dance together. Their movements are soft, wistful, and the violins here are so quiet, it almost sounds like they’re whispering. For just a moment, it feels like we are witnessing a forbidden love story. The movements are simple, but there is a genuine sense of connection between the dancers. And then the music stops, and the dancers walk off stage. The connection is severed and the performance resumes its tortured, fragmentary state. ‘5 Tangos’ comes as a welcome relief after the difficulty of the first two acts and it finishes the evening on a high. Tango, as a form, is about passion and strong chemistry between partners, and the sense of emotion and warmth in Hans van Manen’s choreography melts away uneasy atmosphere of the previous acts. The European sounding music, the sultry eye movements, the flashes of red in the costumes, the flamenco hands: there are elements in this piece which are familiar, restoring the audience from a sense of disorientation. This is definitely the most ‘feel good’ dance of the evening; however, that is not to say that this is an easy-going piece. The music and movement are still incredibly complex and experimental in parts. Like the previous two acts, ‘5 Tangos’ continues to push the ‘traditional’ boundaries of ballet, such as in the Fourth Tango where two men dance together as in traditional male/female holds, or in the very concept itself. Tango and ballet as dance forms could not seem more opposed, and yet van Manen has merged them together in such a way as they become one. Scottish Ballet’s ‘Autumn Season’ resists and challenges labels traditionally associated with ballet. ‘Beautiful’, ‘soft’, and ‘elegant’ are words which seem redundant when trying to put language to this wordless theatre-form. While this ‘Autumn Season’ will certainly not be for everyone, there are moments buried inside each piece which make the evening, as a whole, deeply memorable. Posted in Arts and tagged ballet, review, theatre. Bookmark the permalink.